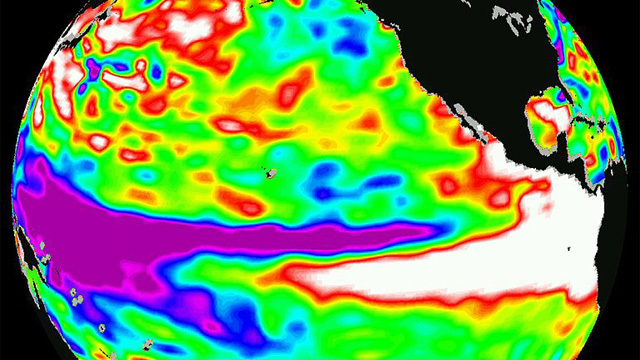 Federal climatologists say it's looking more likely that El Niño conditions will develop in the Pacific Ocean by this summer. It's a combination of ocean conditions long associated with wet, stormy winters, though the connection can be tenuous -- especially in Northern California. The latest report from the NOAA Climate Prediction Center puts the chance of a summer El Niño at better than 65 percent, based on observations that, "collectively indicate a continued evolution toward El Niño." That's when, in simplest terms, the usual trade winds ease, plowing less surface water westward, reducing upwelling of colder water below and allowing the surface water to warm up more than usual. Scientists caution -- and history affirms -- that having an El Niño is by no means a clear indicator of heavy precipitation, though some of California's biggest soakings have coincided with that phase of the "oscillation," as it's known by meteorologists. In the El Niño winter of 1997-98, parts of California saw as much as double their normal amounts of precipitation. The conventional pattern is for El Niño conditions to create wetter winters in the Southwest, drier in the Pacific Northwest, with the flip side of the oscillation, known as La Niña, favoring the opposite. But central and Northern California lie along a fuzzy dividing line, where often it can go either way. The stronger the El Niño (the warmer the water), the more likely it is to produce stormy conditions and a wet winter throughout California. But, "It's no sure thing," says Mike Halpert, acting director of the Maryland-based CPC. "For about the past ten years, the atmosphere and the whole climate system in the Pacific has favored more of the cold phase -- the La Niña phase," Halpert cautions. 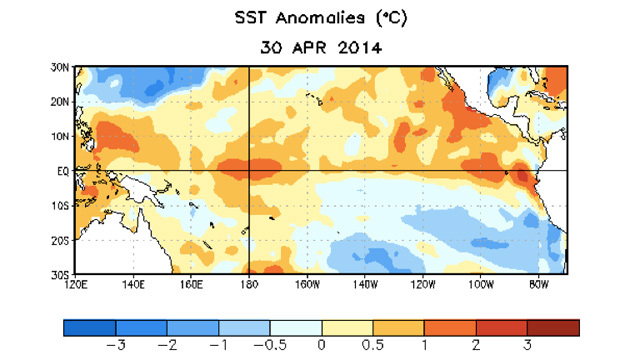 "It's possibly one of the reasons why, back in 2012, we were at a 75 percent chance of El Nino, and it didn't develop." Halpert says it's definitely premature to mark "end of drought" on your fall calendar. "One of the things I like to tell folks is that with a probabilistic forecast, you're never really right or wrong."